Kamloops, population 80,000, is located in the center of the Thompson Okanagan tourism region of south central British Columbia approximately 3-1/2 hours by car from Vancouver, British Columbia and 5-1/2 hours from Seattle, Washington. 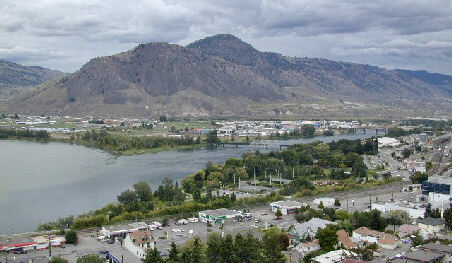 Kamloops lies on the Thompson River. Set against the backdrop of arid hillsides, enchanting lake vistas and scenic rivers, the city lies at the heart of British Columbia's southern interior, at the confluence of the North Thompson and South Thompson rivers. Visitors will find a clean, lively city with plenty of activities and attractions for indoor and outdoor recreational pursuits. The city features a variety of museums, art galleries and live productions. Sports enthusiasts can enjoy hiking, bicycling, fishing and golf in the summer and tobogganing, snow skiing, ice fishing and ice-skating in the winter. Positioned at the crossroads of several major highways, Kamloops is an easy drive to the Rocky Mountains, the Okanagan Valley and the northern Cariboo region. Accommodations around the Kamloops area include centrally located hotels, as well as a variety of guest ranches and fishing lodges that are within a day's drive from the city. Kamloops' downtown offers a comfortable atmosphere for strolling, shopping and dining, while enjoying the city's warm summer weather. Copyright © 1997-2011 Go Northwest, LLC. All rights reserved.